The global genomics personalized health market is anticpated to be highly fragmented due to presence of large number of palyers in the regional and global market. Some of the key players in the industry are Thermo Fisher Scientific, Inc., QIAGEN, Illumina, Inc., Bio-Rad Laboratories, Inc., Lonza Group, F. Hoffmann-La Roche AG, INVITAE Corporation, Interleukin Genetics Inc., Genetic Technologies Limited, Eastern Biotech and Life Sciences, uBiome, Inc., DNA Genotek Inc. which is a subsidiary of OraSure Technologies, Inc., and XCode Life Sciences Private Limited. In 2016, among these the 4 top players –Thermofisher Scientific, QIAGEN, Illumina Inc., and F. Hoffman-La Roche Ltd. accounted for around 65% of the overall market. Apart from these, the market is also likely to witness a strong competition among the other players to bag more amount of market share. Major players are getting involved in investment in research and development activities so as to come up with a newer technologies and solutions. According to a recent report by Transparency Market Research (TMR), the global genomics personalized health market is prognosticated to expand at a robust CAGR of 14.9% during the forecast period from 2017 to 2025. In 2016, the market was valued around worth of US$7,243.0 mn, which is likely to reach around worth of US$25,112.5 mn, by 2025. As per the end users, the global genomics personalized health market is categorized into diagnostic centers, academics and research institutes, and so on. 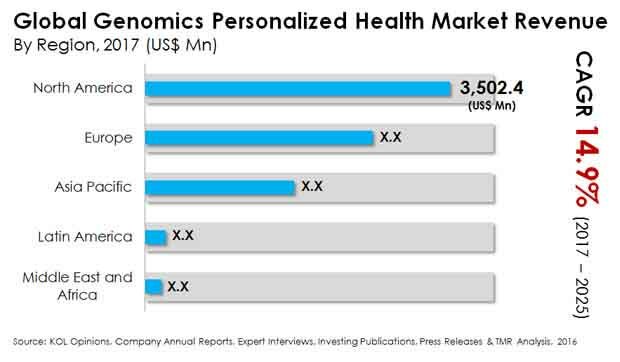 Among these, as evaluated in 2016, the academics and research centers and diagnostic institutes are the two key shareholders in the global genomics personalized health market, with a collective share of near about 88.0%. On the basis of geography, the North America region’s genomics personalized health market held the maximum number of share all over the world, back in 2016. The region was trailed by Europe. This is because of rise in awareness and growth in healthcare expenses in the region. The major factor driving the demand in global genomics personalized health market is rise in investment regarding research and development of biomarkers. Biomarkers play a vital role in identifying the physiological condition of person diagnosed with particular disease. So, the rise in number of people suffering from chronic ailments for example, tumor and diabetes have propelled the demand for diagnosis of the illnesses that in turn is contributing in the growth of genomics personalized health market. Besides, the advancement in pharmaceutical industry, along with efficient diagnosis and monitoring of the response to the disease treatment are also supporting the rise in demand for genomics personalized health solutions, across the globe. Moreover, significant advancement in molecular biology along with advancement in technology are also fueling the growth in genomics personalized health market. Not to forget, the notable rise in elderly population globally, which require personalized healthcare and medicine is another major factor contributing in market grwoth in forthcoming years. However, there are certain restraining factors hampering the market growth, such as complex regulatory system, contributes in delaying the approval of new technique, is a major hindrance to the amrket development. Additionally, inadequate reimbursement policies is another factor preventing the market to reach its full potential in upcoming years. This factor is more prevalent in developing phase. The major factor driving the demand in global genomics personalized health market is rise in investment regarding research and development of biomarkers. The advancement in pharmaceutical industry, along with efficient diagnosis and monitoring of the response to the disease treatment are also supporting the rise in demand for genomics personalized health solutions.